What? The story of an Irish busker/vacuum cleaner repairman who is ready to give up on music, love & life until a serendipitous meeting with a Czech musician who sets him right on all fronts. Why? 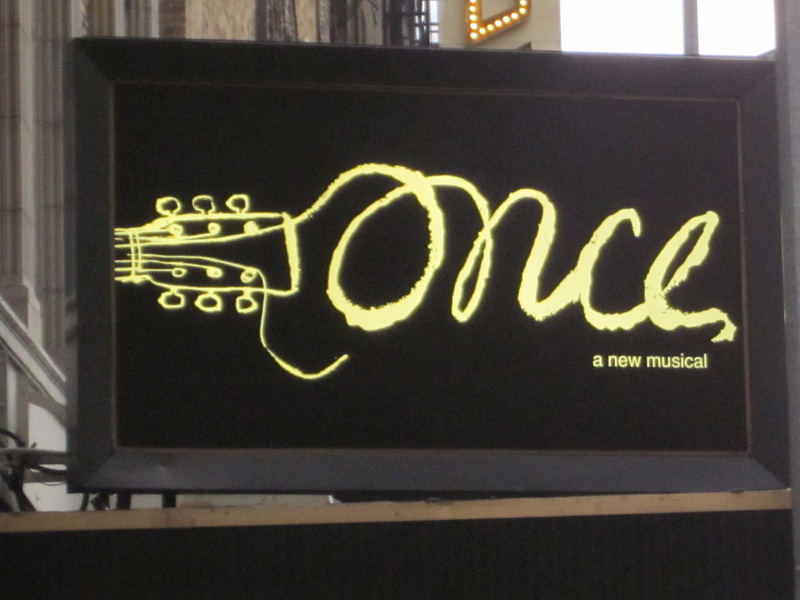 I saw this off Broadway and fell in love. Was anxious (and a little nervous) to see how it translated to Broadway. Well? I needn't have worried :). The show's new home suits it well; and the things I loved are there in spades. You are still greeted with an onstage (open) pub when you enter the theater, and the cast of musician/actors playing a seisun of Irish & Czech tunes. In fact, the set seems a bit more intimate, and I enjoyed standing on stage with my beer and listening and toe-tapping to the music just inches from the musicians. Really a great experience. Steven Kazee (Boy) brings a completely believable weariness laced with the abject need to maintain a faith in the future. 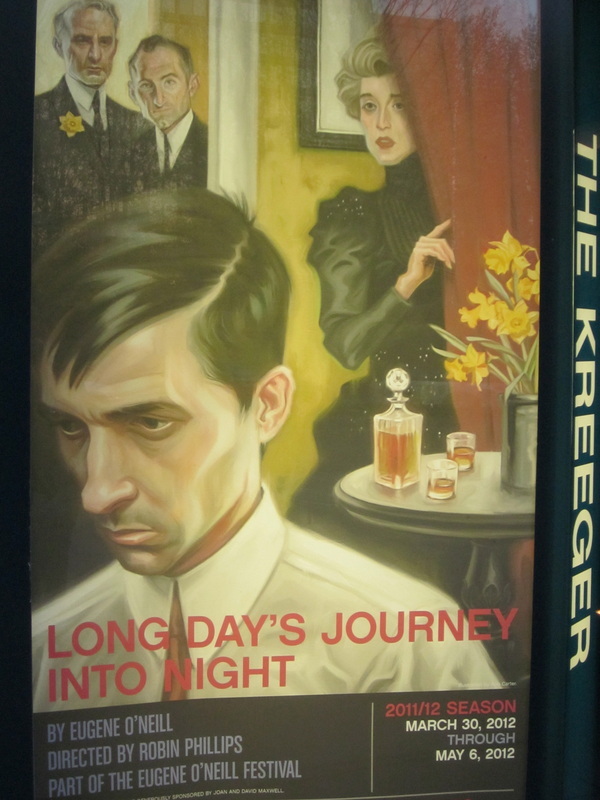 When he meets Girl (Cristina Milioti), and she gives him no option but to come with her on the journey, his thaw begins. 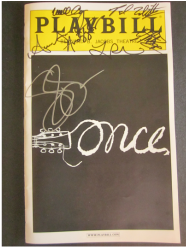 The tune we all know from the movie, "Falling Slowly," definitely gets its due, but there wasn't a song I didn't love. The ensemble cast is fantastic. I cared about each character's story, no matter how small. The choreography/movement is fresh and interesting and the integration of the music and the action is seamless. In the end, I would describe Once as a quiet, gentle show about caring for our hearts and always leaving ourselves open to what life gifts us with each day. As far as relationship to the movie, I will say that I saw the movie many years ago; too long ago really to "compare" them. 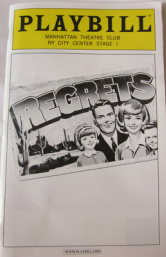 I remember loving the movie and I love the stage musical. Why? Absolutely loved the prequel, "Boeing, Boeing," a farce of epic proportions. Well? 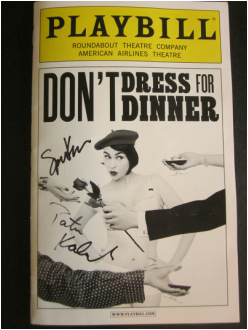 Stop if you've heard this one: a husband, a wife, a mistress, a lover, a caterer and another husband spend an evening of miscues and miscommunication together, resulting in general hilarity. Even if you haven't "heard it," you can probably imagine how it's all going to go. While this chapter did not quite live up to the promise of its predecessor, it was fearlessly acted and even the most predictable of moments generated satisfying laughter. The star is most definitely Spencer Kayden, who plays the caterer around whom much of the chaos centers, and that hilarious chaos is in such good hands with her. There are numerous pratfalls and each of the actors seemed to embrace the silliness fully. What? 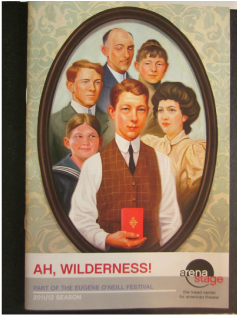 Eugene O'Neill's coming of age story about a family in New England dealing with the morality of the times and the solidarity of family on a hot July 4 holiday in 1906. Why? 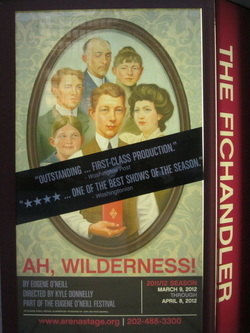 I was not familiar with this play beforehand, but the synopsis sounded intriguing and the cast was top notch. Well? 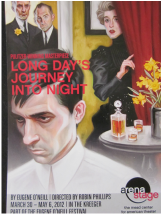 This was an endearing journey with appealing characters, particularly the parents of the family, played with humor and warmth by Rick Foucheux and Nancy Robinette. I really love the Fichandler space and the staging added even more depth to the story as the set transformed from the house to lakeside to a dive bar. The play starts slowly and draws you into the languid climate of July in Connecticut; all the better for emphasizing the electric current of emotional chaos lurking below the mannered surface. I found myself really caring about these people and, at the close, wanting to know what happens to them beyond the final curtain. Special mention to June Schreiner, a young actress who I enjoyed greatly in last summer's "Oklahoma" at Arena. She is charismatic and natural, with a lovely presence on stage. I fully expect to be watching her on a Broadway stage in just a few years. What? A dark comedy about a dysfunctional family dealing with multiple family crises. Why? I love Linda Lavin. Well? 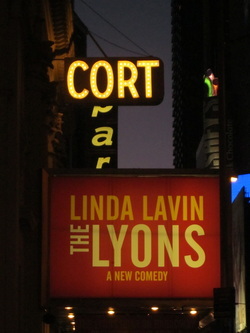 All Linda Lavin has to do is look archly at her scene partner (or the audience) and it elicits gales of laughter. I saw her in the recent Follies revival at The Kennedy Center, but this was the first time I'd seen her in a lead role and I was unprepared for the force of her comedic talent. Linda plays the wife of a dyspeptic, angry man dying of cancer and therefore, devoid of all filters. Their children are each battling demons (a disturbed, and disturbing, gay son and an alcoholic daughter late of an abusive marriage) that are played to unexpected hilarity as they interact with their parents in the hospital. The play has its dark moments and they hit especially hard because you feel lulled into "safety" by the deft handling of the humor by Lavin. Why? I told Hunter I would try to get back up to see the show once more before he left the role and it worked out that I was able to do it. Well? I have now seen the show from nearly every angle of the theatre, and I don't think there is a bad seat in the house. 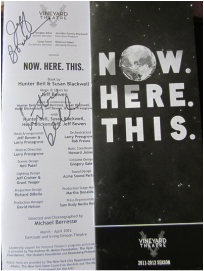 At this particular visit, I was primarily focused on enjoying Hunter's performance and the chemistry of this cast together one last time. I could not be happier that I made the effort to do this. I waited after the show to chat with Hunter one last time and I am happy that I've gotten to share with him how much it has meant to me that they took this show that has always been so very special to me and made it even more of a force for good in my life. Hunter is an incredibly kind, genuine and gentle soul. 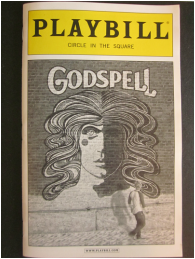 This first Broadway revival was very lucky to have him recreate the role of Jesus at its birth :). Corbin Bleu (of "High School Musical" and "In the Heights" fame) will be taking over the role of Jesus beginning April 17, 2012. Why? I really enjoy Ford's as a venue; I've always wanted to see this show; and I love Brooks Ashmanskas (who plays John Adams) from his Broadway roles (especially Promises, Promises). Well? Great fun, great acting, great set. 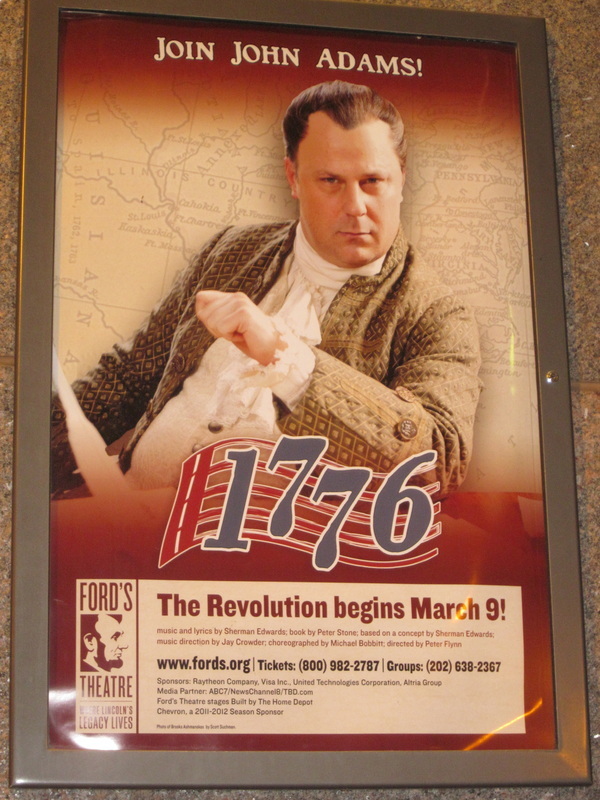 I have long wanted to see "1776" and Ford's is the perfect venue. The cast gelled well and sang beautifully together. I enjoyed the balance of humor with history, and thought the serious parts were given the necessary gravity, while allowing the foibles of humans to keep it appealing and relatable. What? A stage adaptation of the popular movie starring Patrick Swayze, Demi Moore & Whoopi Goldberg about a woman whose boyfriend is murdered and makes contact with her from the beyond. Why? 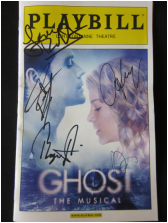 I am a huge Caissie Levy fan and she's the actress who plays the lead in this show. The show had a hugely successful West End, London run and is transferring to Broadway with the original pair of leads (Caissie and Richard Fleeshman). Well? Fantastic show! The special effects are breathtaking but do not obscure or detract from the romance of the story. The lead actors are phenomenal and the songs (especially Here Right Now & Outta Here & With You) feel organic to the story. I will go back. What? In 1969, Judy Garland played The Talk of the Town in London just months before she died. This show tells the story of those weeks and the two men by her side. Why? Word of mouth on this has been great. 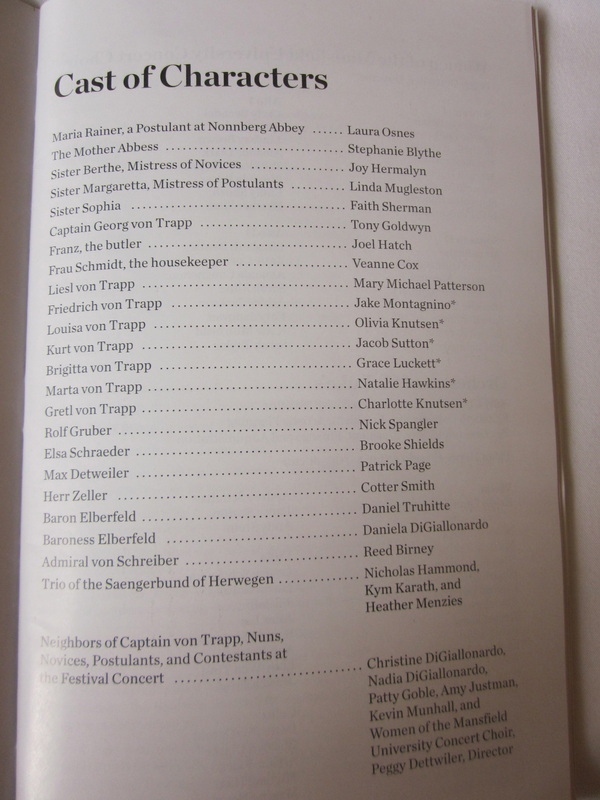 But more importantly, the opportunity to see a bravura performance onstage is always enticing to me. Well? 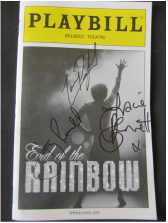 Tracie Bennett's performance was breathtaking...she quite literally brought Judy Garland back to life on that stage. Her voice, her body movements, her heart truly made me feel as if I was watching Judy Garland. I think it was appropriately respectful and yet raw. I'm not sure if it adds anything much new to the legend that is Judy Garland, but particularly in the relationship between Judy and her pianist for that engagement, Anthony, I feel as if I now see her more as a human being and less as a legend. Why? This has me written all over it. Any show that has "starstuff" as an ingredient is likely to make me a moth to a flame. Well? Magic. Just plain old theater magic. Incredibly charming, quirky, consummately acted and belly-laugh funny. The set is inventive and clever and constantly surprises. Celia Keenan-Bolger (a fabulously talented primarily stage actor) and Christian Borle ("Smash" on NBC), along with a hugely likable, talented cast. What? Poignant, humorous and musical riffs on life and relationships-with self and others. Right up my alley. Why? 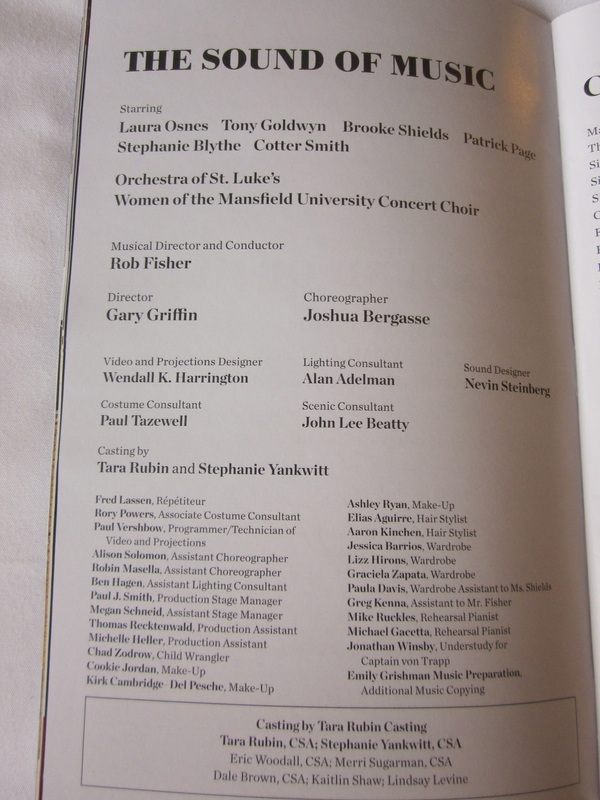 This is the team that did "[title of show\" (had a Broadway run in 2008), which I just loved. I was thrilled to discover they had done a new piece. Well? I laughed. I cried. I learned. I didn't want it to end. These four performers have created an intensely human, very personal piece of theater about life & being you with all your quirks and foibles and wonder. These are special people with big talent. What? 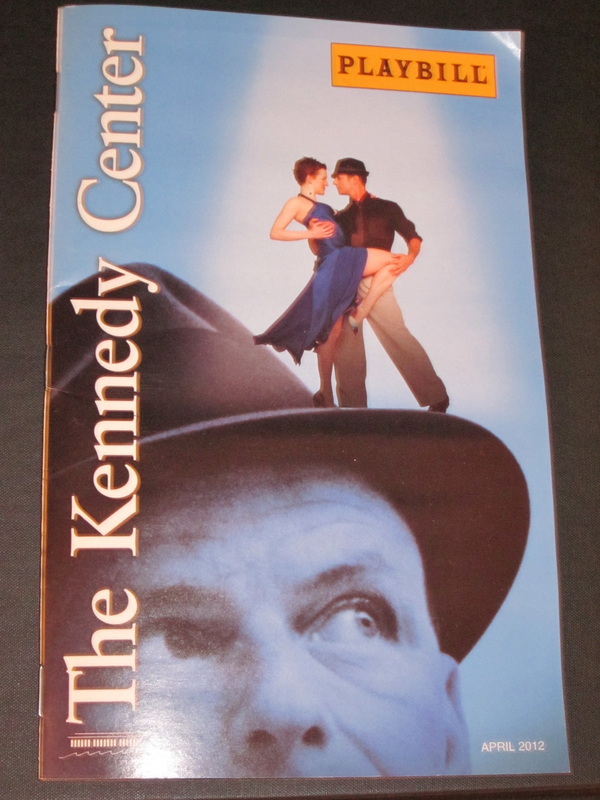 A series of dance scenes set to Frank Sinatra's music and choreographed by Twyla Tharp. Its backdrop "story" is couples moving in and out of relationships. Why? This actually is a show I intentionally skipped during its Broadway run because there were other things higher on my list. Also, I'm not a huge Frank Sinatra fan. I am, however, a huge Twyla Tharp fan and have had a tinge of regret that I didn't see this for the choreography alone. Now that it's on tour and at the Kennedy Center, seems like a good time :). Well? A lovely, romantic, thrilling piece of dance theater. The fluidity of the choreography is often breathtaking; and the dancers (including a number of understudies in this performance) were wonderful. In particular, this show requires the dancers to exude personality as there is no dialogue and frequently a great deal of movement going on across the stage. The principal dancers in this cast get an A+ for personality :). The band was also terrific, and the unusual twist of having a live band accompany recorded vocals worked surprisingly well. I heard very high praise being expressed as I left the theater, and, especially if you are a Frank Sinatra (or just big band) aficionado, this is a great choice! What? 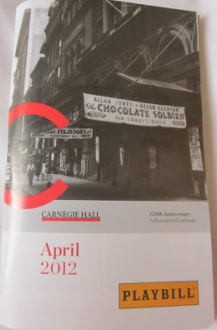 A one-night only concert performance of the The Sound of Music to benefit the programs of Carnegie Hall. Why? It's The Sound of Music. It includes a cameo by three of the original actors (who played the children). 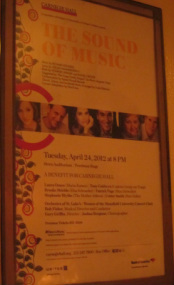 It stars Brooke Shields, Laura Osnes, Tony Goldwyn and others of whom I'm a fan. It's all good. Well? What a lovely evening! You simply can't go wrong with this beautiful music and wonderful story. Even without costumes and full staging, the magic of the show came through. Laura Osnes is truly a star; she brings a luminous quality underscored by a marvelous voice. 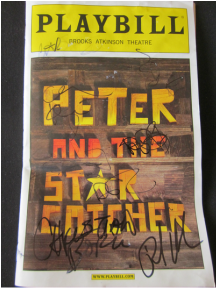 Although Tony Goldwyn & the younger actors did not match the talent of Osnes & Patrick Page (even Brooke Shields, who is so charming on stage), it was still great fun. And the cameo appearance by the original actors (without fanfare, so I suspect a significant portion of the audience was not aware of the connection) was such a treat. I also enjoyed the use of the projected backdrops to give a sense of place. What? 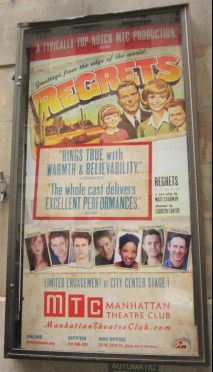 A world premiere of a play about a young man with a secret at a camp for men obtaining quick divorces in Nevada in the 1950s. Why? The cast includes Alexis Bledel ("The Gilmore Girls") & Richard Topol, both actors I enjoy; and the venue is wonderful. Well? I absolutely loved the beautifully crafted set for this play. It was evocative and interesting; especially given that all the action took place in such a small space. 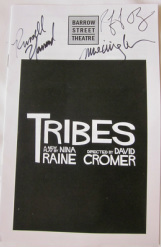 The cast was great; particularly Richard Topol and Adriane Lenox. I am always amazed that so much can happen on a single set in 100 minutes. The actors did their jobs as I found myself caring what happened to each of the men and the young girl who needed them. There's no happy ending to this story...but hence the apt title. What? The story of a deaf man raised in a hearing family and his journey to being understood when he meets a hearing woman raised in a deaf family who is now going deaf herself. Why? I used to know sign language and took classes at Gallaudet University in DC, so the subject matter really interests me. 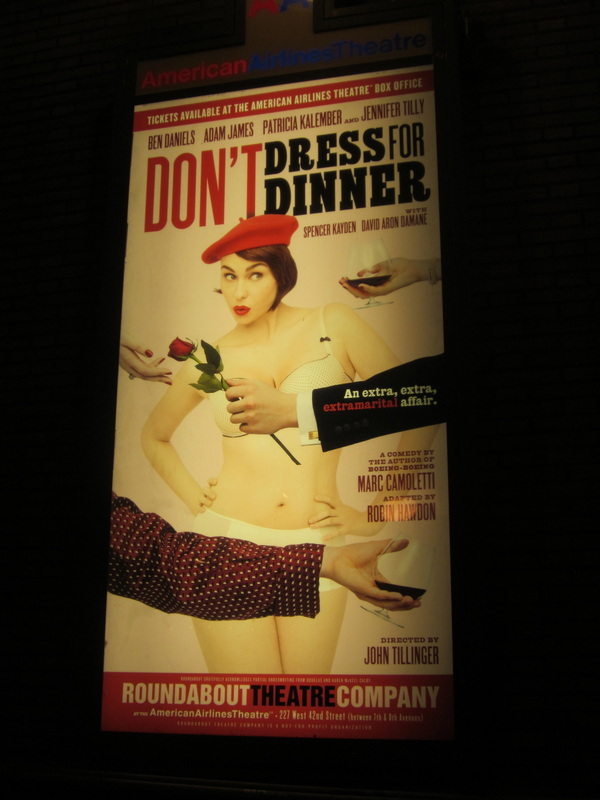 Also, it has great word of mouth, and I've been interested in seeing more off Broadway shows. Well? There are shows that you know will stay with you for a very long time. The Normal Heart for one; The Scottsboro Boys for another. 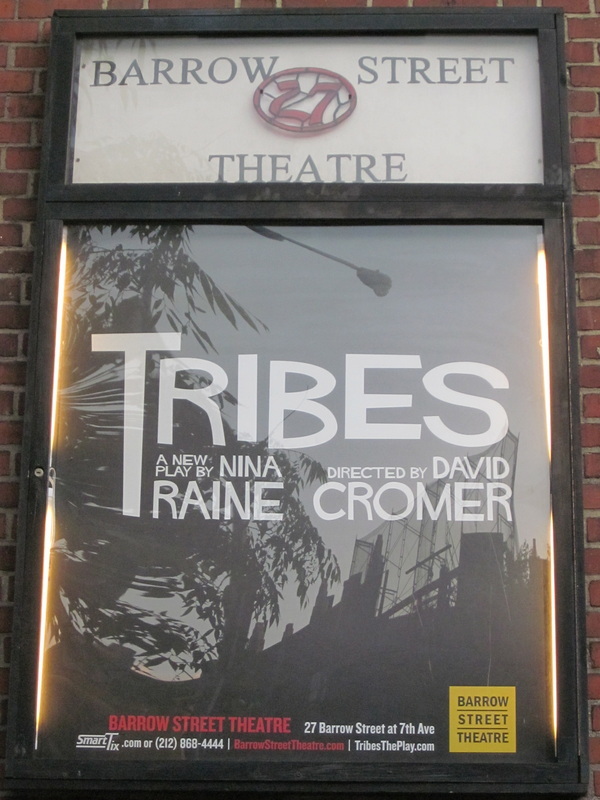 Tribes is one of those plays. The small theater in a square with seats on all sides at stage level was perfect for immersing you in the life of this family around its oversize dining room table; the size both accommodating shifting purposes and symbolizing the wide gulf of misunderstanding going on amongst the characters. 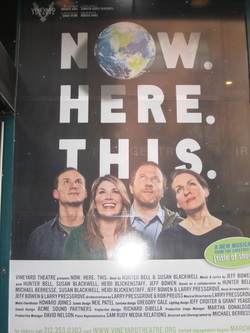 The lead, Russell Harvard, a deaf actor who is a graduate of Gallaudet University is heartbreaking and so powerful as the son of well-meaning but, at times, emotionally dysfunctional parents (Mare Winningham is brilliant as his mother). The deep and moving bond between Billy and his creative brother, who suffers from some form of mental/emotional dysfunction (he is tormented by voices in his head from which he cannot escape; Billy seems the only one able to calm him) gives real weight to the title of the play; they create their own small tribe of two. Having had personal experience with the issues of "belonging" in the deaf community, the relationship between Billy and his girlfriend (Susan Pourfar) rings very true. I had a lovely chat with Russell after the show. What? 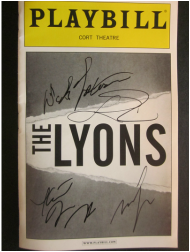 The Pulitzer Prize and Tony Award winning play by Eugene O'Neill about a family confronting its demons and trying to save itself. Why? This is another play that I have always meant to see, and now's the time! Well? I have to thank Arena Stage for showcasing the works of Eugene O'Neill this spring. For someone who loves the theater as much as I do, I am often surprised about how much I haven't seen (but feel as if I have). The cast was so strong and somehow made you laugh while being utterly devastated at the same time. Helen Carey (Mary) was haunting as the drug-addicted wife/mother and Peter Michael Goetz (James Sr.) as her alcohol-dependant husband just broke my heart but still made me believe in love despite the obstacles. O'Neill's plays make me feel as if I have stumbled upon a bit of quicksand in an otherwise gentle meadow. I can't help but stick my toe in...and then I'm enveloped.